Zenit Saint Petersburg midfielder Leandro Paredes has fuelled speculation over his future amid links with a potential transfer to Chelsea. The 24-year-old seems to be one of a number of midfield targets on the Blues’ agenda this January following Cesc Fabregas’ move to Monaco. Paredes was linked alongside Nicolo Barella in a recent report from Corriere dello Sport, translated by the Metro. 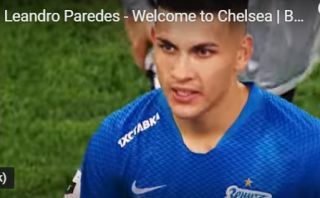 It now seems the Argentine welcomes interest from Chelsea if his Twitter activity is anything to go by, as he’s retweeted a video onto his timeline titled ‘Leandro Paredes – Welcome to Chelsea’. While Paredes is perhaps not the biggest name, one imagines Chelsea fans would welcome almost any signing in midfield right now to strengthen their squad. CFC have quality players in Jorginho and N’Golo Kante in that area, but are also relying on Mateo Kovacic, who is only at Stamford Bridge on a season-long loan from Real Madrid.